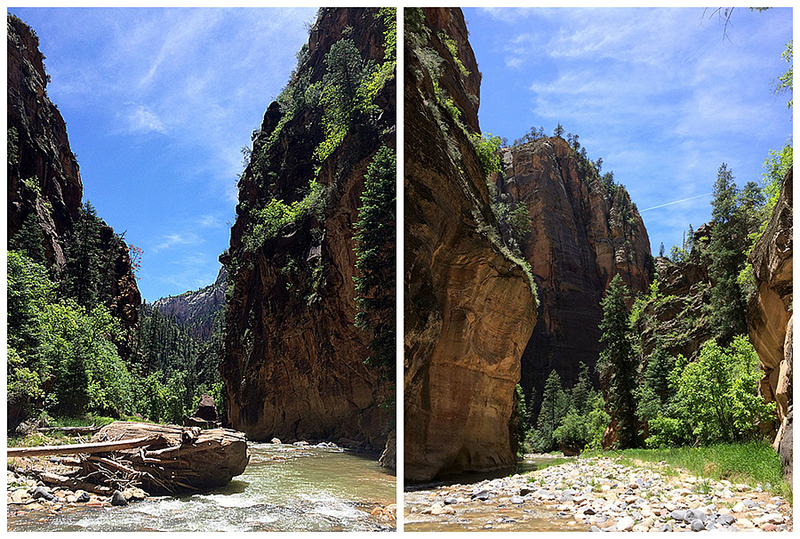 - On Wednesday, Whitney and I set out for our final and grandest hike of our trip, the Narrows from Chamberlain Ranch down to the Temple of Sinawava inside Zion National Park. 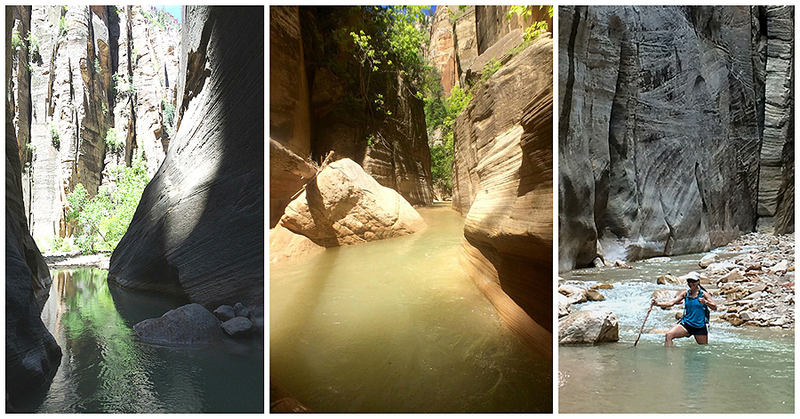 Sixteen miles of hiking, most of which is through a river with narrow high rising canyon walls on each side. - Most hikers do this route over two days but we decided to hike light and attempt it on one day. Before starting the hike we needed a back country permit, which believe it or not was never checked (it's cheap, costs about $10 but they only give out a total of forty a day). Also we needed some water shoes and a wooden staff, which would help us stay balanced over several miles of hiking through the river, these we got in the town of Springdale which is located right outside the park across a bridge leaving the visitor center. - The park rangers and the internet did their best to make me anxious/stressed going into the hike as both warned of flash floods, cold water, hypothermia, strong currents, water over your head, it'll take twelve to fourteen hours, yada yada yada. Once again, Whitney and I are experienced and very strong hikers and at the end of the day these warning were seriously overblown and the hike was a blast! Unless there is a torrential downpour in or north of the park this hike in late May makes for a perfect one day adventure. 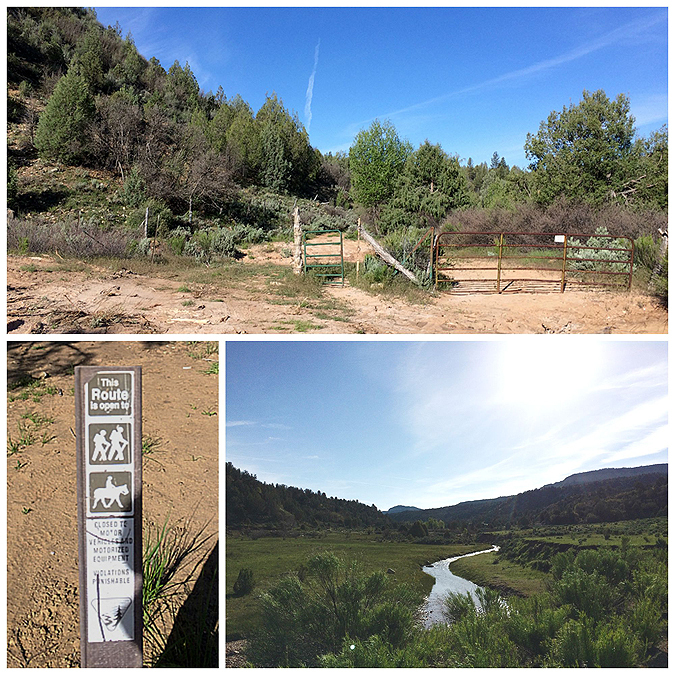 - The most difficult part of the hike was actually getting to the trailhead at Chamberlain Ranch! 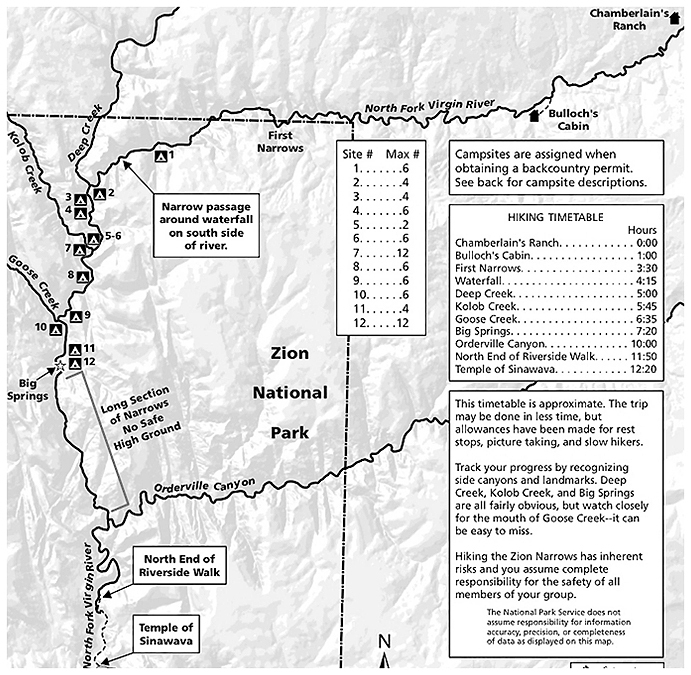 In order to hike the Narrows most hikers pay a shuttle to drive them from Zion National Park to Chamberlain Ranch. 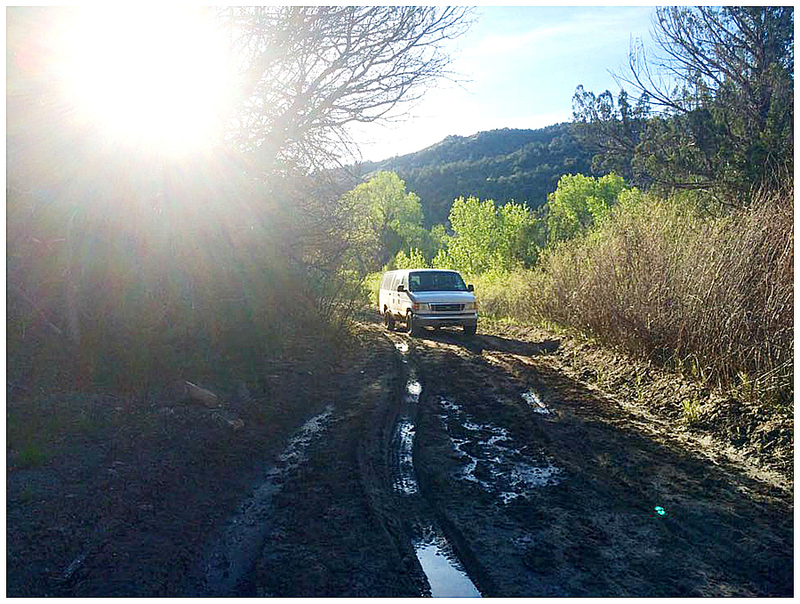 It takes almost ninety minutes to get to the trailhead because the road to Chamberlain Ranch is a clay dirt road that can be hellish and impassible during rainy weather. Luckily, the road had a decent amount of time to dry from the previous weeks showers and our shuttle driver did his best to get us as close as possible to the trailhead. We made it about a mile from the trailhead when there was standing water / mud pit in the road that he knew he couldn't get us through, so out we went! - The hike down the road to the trailhead was easy and took no time at all. There were two other groups of hikers starting out when we got down there, one group were day hikers, the others were backpackers. 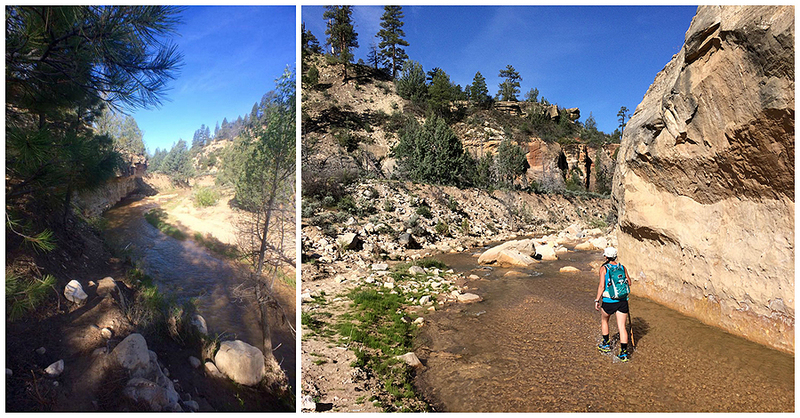 Whitney and I put on our ADIDAS water shoes and started our hike from the open plateau at Chamberlain Ranch. 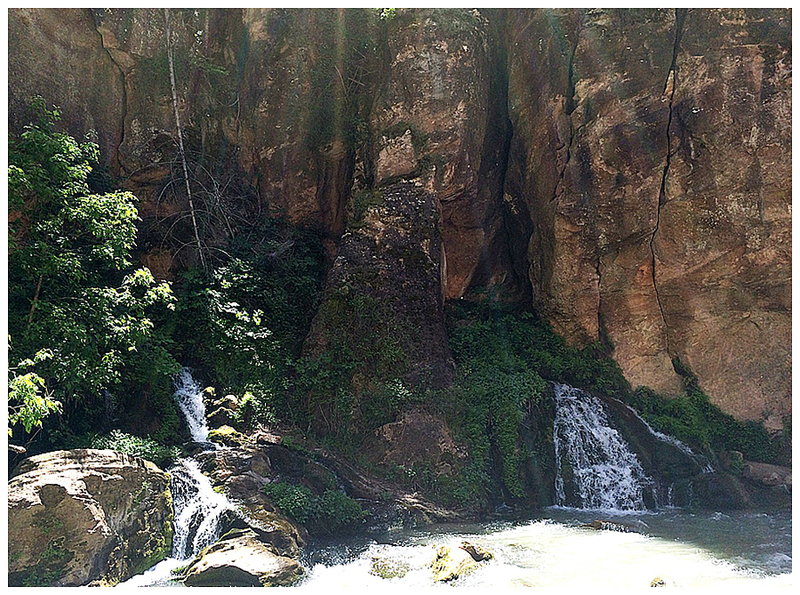 - The first three miles travels above and to the left (south side) of the North Fork of the Virgin River. It's really easy hiking over an old dirt road as it passes through an open area with decent views of the surrounding plateau. The highlight of the first three miles is passing by the remains of Bulloch's Cabin, an old homestead that is slowly breaking apart as time takes it toll. About a half mile past the cabin the road ends and the trail descends into the North Fork where the real fun starts. - Over the next thirteen miles Whitney and I would be hiking mostly in the river. The first thing we noticed was the water temperature, which was not as cold as we were told, felt quite refreshing. 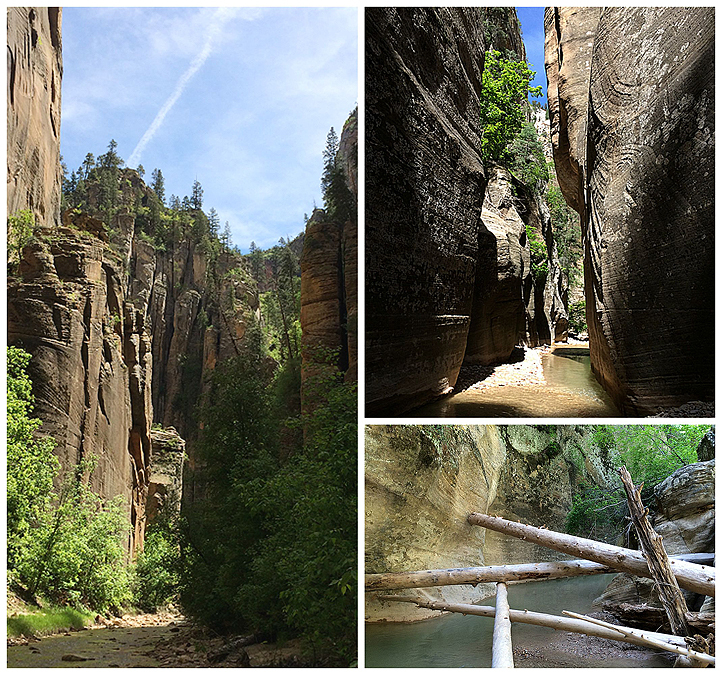 - The upper section of the Narrows along the North Fork went back and forth from semi open sections where the banks of the river went into the forest to narrow sections between semi high canyon walls. The further we hiked the higher the canyon walls shot up and there became less of the beach and forest sections to escape out of the water to. However, the water was never deep over the first few miles so it was a non-issue. - Walking through the water took a little while to get used to. 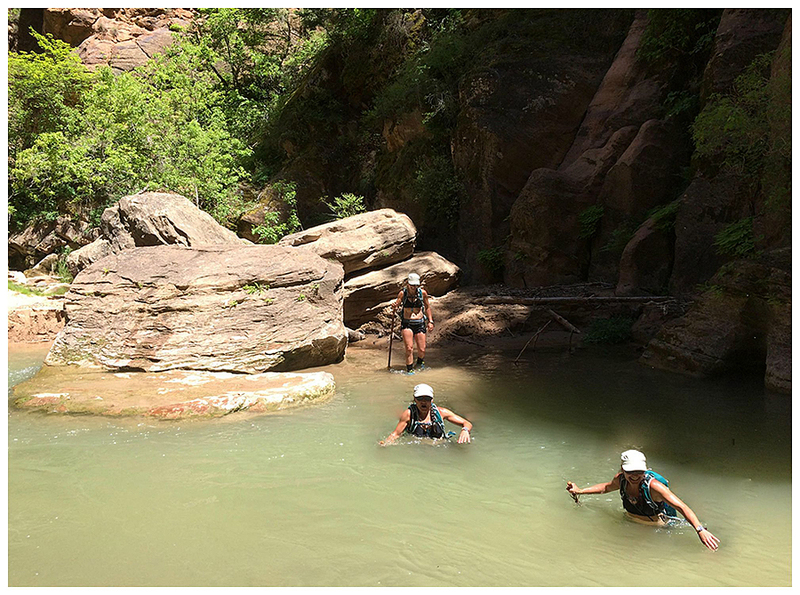 We were both really happy we rented the water shoes as the small rocks underfoot moved around and if we just had our trail runners on our ankles would have taken a beating whenever we lost our balance for a brief second. The wooden staff also was key to maintaining our balance. We were walking with the current so that made it easy to hike and the current was really tame for 75% of the hike making it easier for us to learn how to navigate through the river. We were also happy we did not take the park rangers advice on renting a wet or dry suit as we would have sweated our asses off! Luckily, the employee at the place we rented our shoes and staff from said they weren't necessary, thank you so much for that advice! 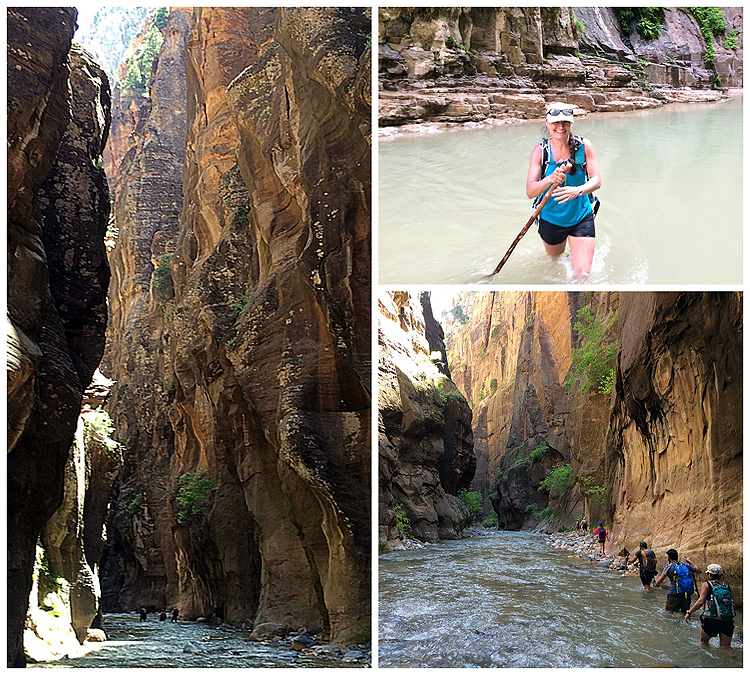 - Around mile 9ish is when the hiking through the Narrows becomes really spectacular. After passing by a boulder / log jammed waterfall the walls rise steeply from the river, hundreds of feet high, and stay that way throughout most of the next seven miles. Water levels get deeper as the Deep Creek comes flowing into the North Fork from the right (north). Both of us never felt uneasy as the water levels increased, in fact, the deeper the water the more fun we had! - After Deep Creek the Narrows were interrupted ever so briefly by small areas of beach sections with trees and bushes. In these areas were the overnight campsites for backpackers. I expected to see a ranger on duty through here but all we saw were the other day hikers who we hopped back and forth with a few times and a weird dude telling us his group had to spend the night because the water was to deep up ahead and they got cold. He was right, it was deep...for about twenty feet then it was back to the normal shin to knee deep wading in the refreshing water. - Around mile twelve we made it to Big Spring, this is where we ran into the tourist hikers. They are allowed to hike 4.5 miles upstream to Big Spring then they have to turn around. 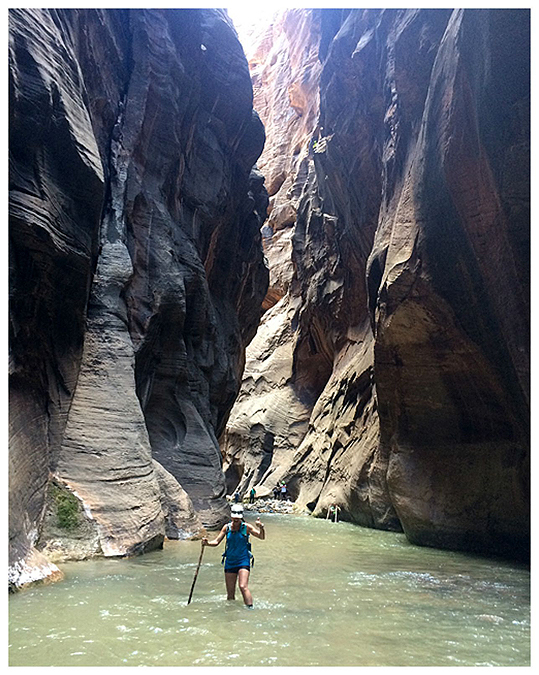 - The most awe inspiring part of the Narrows is this 4.5 miles stretch because it's where the walls are the highest and the water is the deepest. It really is an out of this world experience. It was funny to see the hikers struggling in the water as we motored past them, after hiking twelve miles we had figured out how to plow through without losing our balance for the most part. This section of the Narrows is called Wall Street, imagine being in NYC, standing in the middle of the street and looking up at the high rises. Now replace the street you're standing on with a river, the high rises with steep canyon walls, and the taxi cabs with hikers and you have the Narrows! 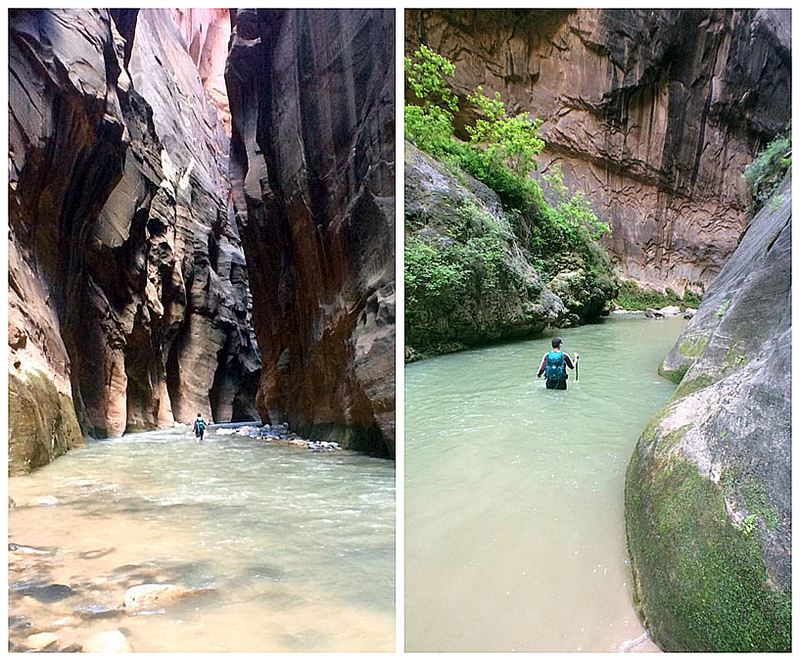 - The sun does not shine through the canyon while hiking through Wall Street so we both got chilled a little bit since we were constantly in kneed to waist deep water. We kept on moving to stay warm and to avoid the crowds that were floundering about the river. 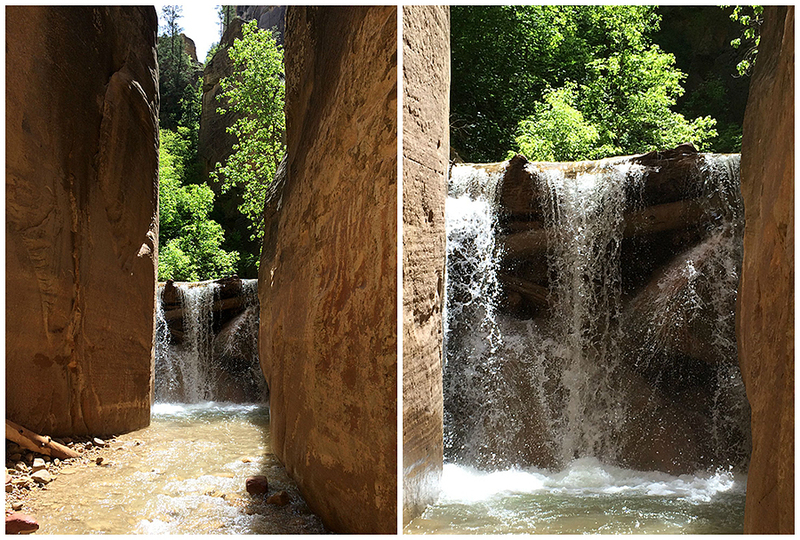 - Eventually the Canyon walls lower, sandy beaches with some vegetation appear, the sun shines in, and the river opens up and drops in volume. Unfortunately the tourists quadruple and the quiet scenic hike takes on a zoo like feeling. 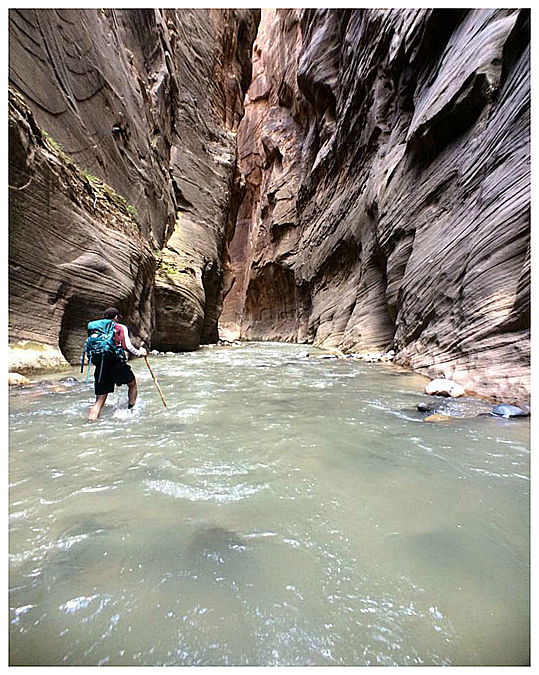 Still, that first twelve miles as the river flows quietly from a Chamberlain Ranch as it ever so slightly cuts through the ground and into a canyon as high narrow walls of rock shoot steeply to the left and right is an experience like no other. 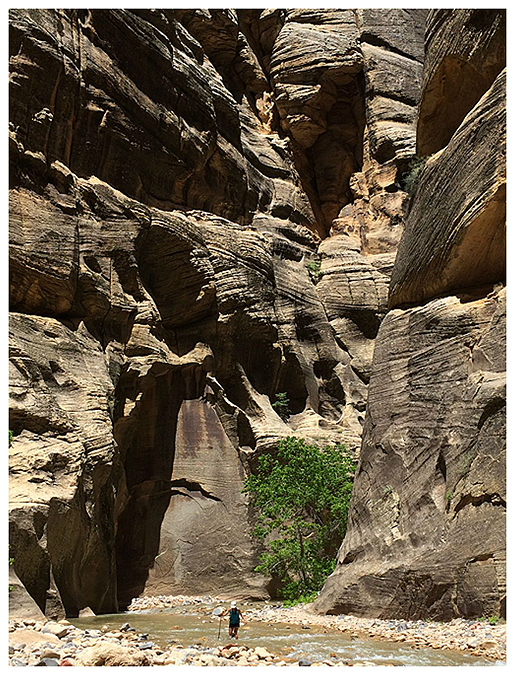 - The hike ended at the Temple of Sinawava where we jumped on the free canyon shuttle bus back to the visitor center. 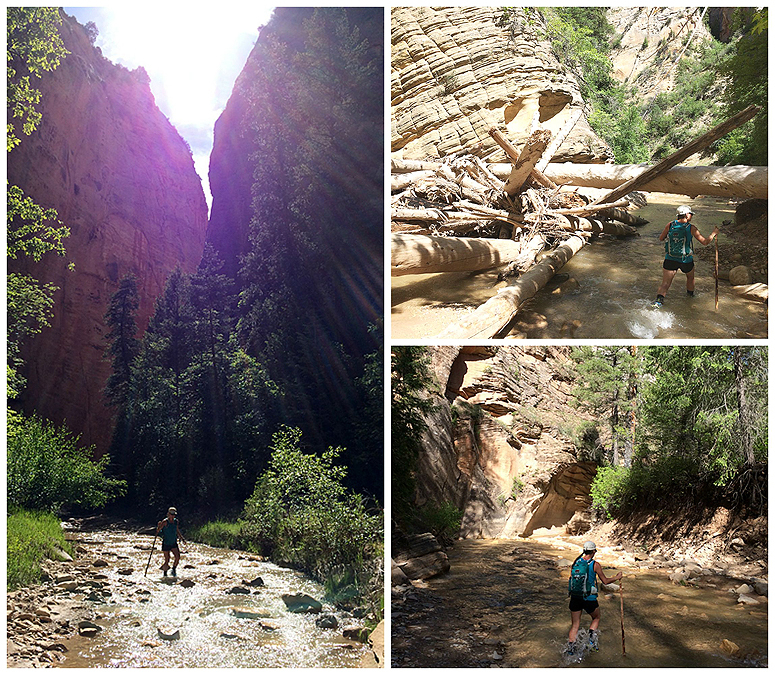 We then walked out of the park to Springdale to return our gear and have a well deserved dinner and drinks ending a perfect last day hiking after a week of exploring the Grand Canyon, Bryce Canyon, and Zion Canyon! This is as far as our shuttle driver's van could make it so we start our hike a little earlier than expected, Goodbye Mr. shuttle guy! 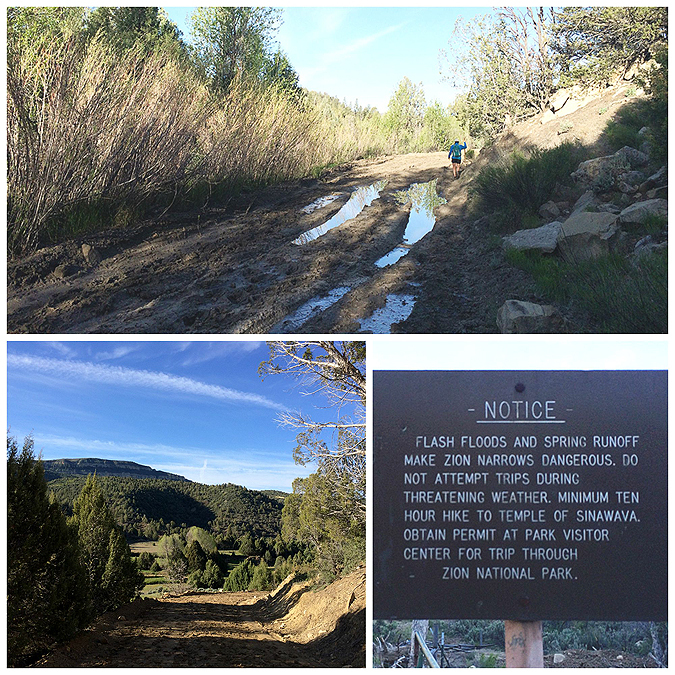 The road walk was short over the muddy and rutted road to Chamberlain Ranch where we are greeted by a warning sign. 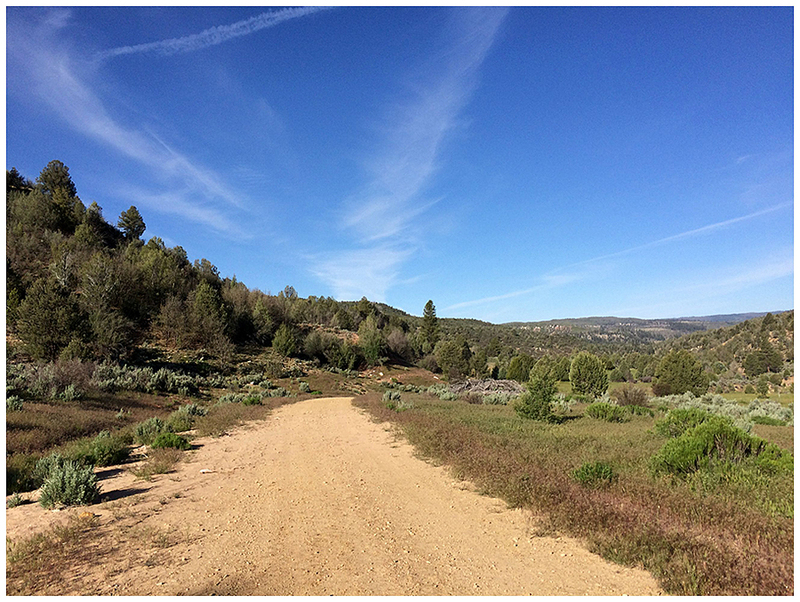 The majority of the first three miles is a nice road walk with open views from the upper plateau. We pass by an old cattle guard and the road soon turns into more of a trail. Up until this point the North Fork of the Virgin River looks more like a stream. 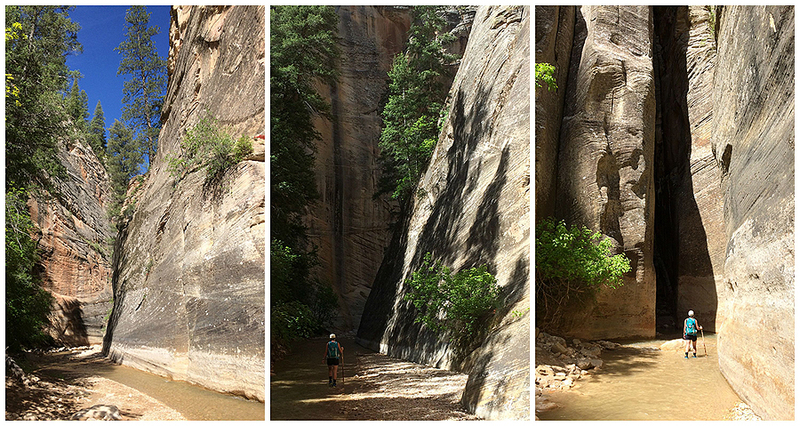 Hard to believe in a few miles we'll be deep inside canyon walls! 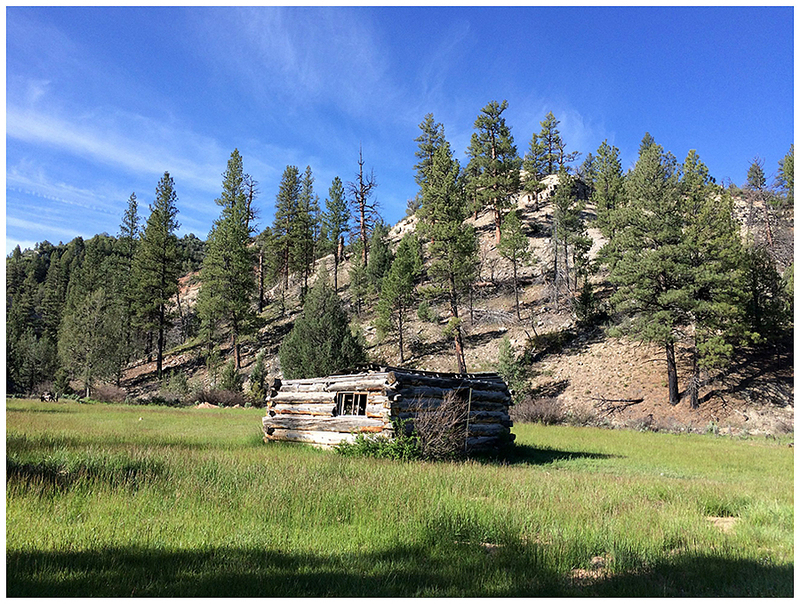 The biggest landmark of the first three miles is Bulloch's Cabin, an old homestead that is slowly falling apart. Soon after passing by the cabin the trail drops into the river and the fun starts! The upper part of the North Fork weaves in and out of the woods, the walls rise but not too high and the water is shallow and the current is slow. Whitney getting comfortable with hiking through the river. Every once in awhile the walls rise steeply giving us a hint of what's to come. We also pass by log jams from previous flash floods! 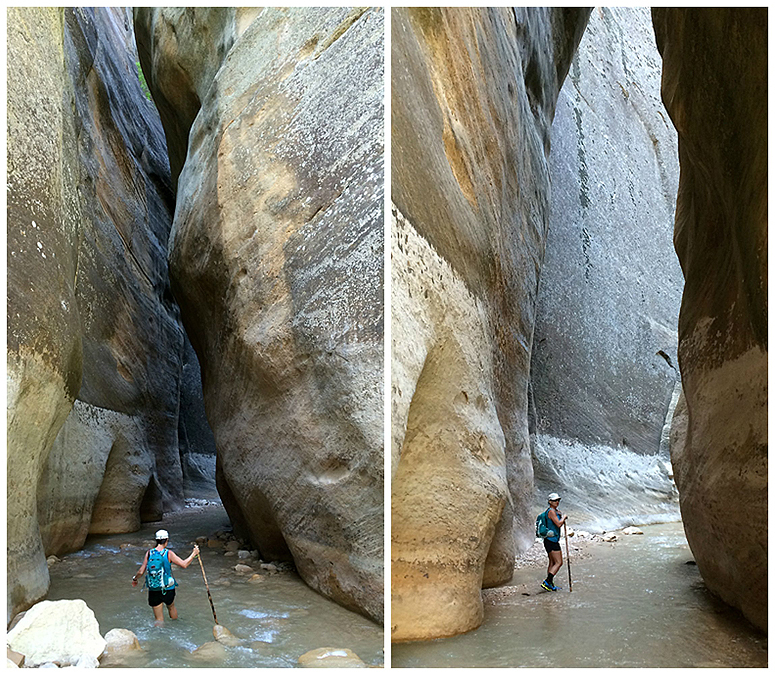 Navigating through another log jam while surrounded by high rising walls of rock. Our first 'swim' section. It was a short twenty feet and it wasn't swimming but the water went up to our chests. It was a lot of fun and Whitney gives it a thumbs up! More narrow passages as we make our way through a no high ground section. 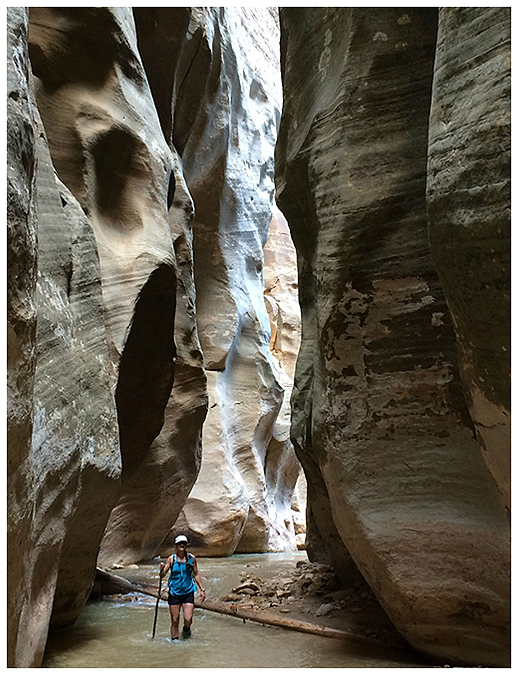 The massive walls make Whitney look like a tiny spec through most of the narrows. 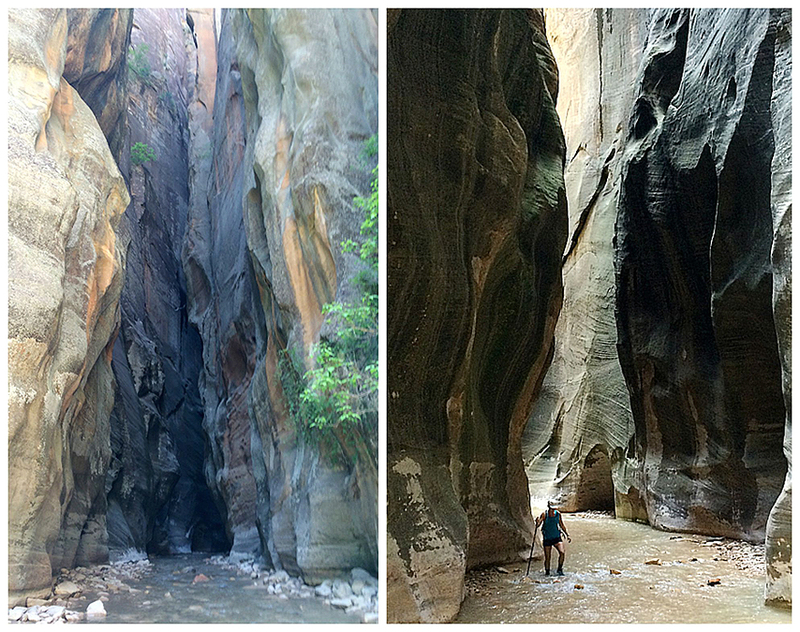 Every once in awhile the narrows would open up into a beautiful rugged forest. 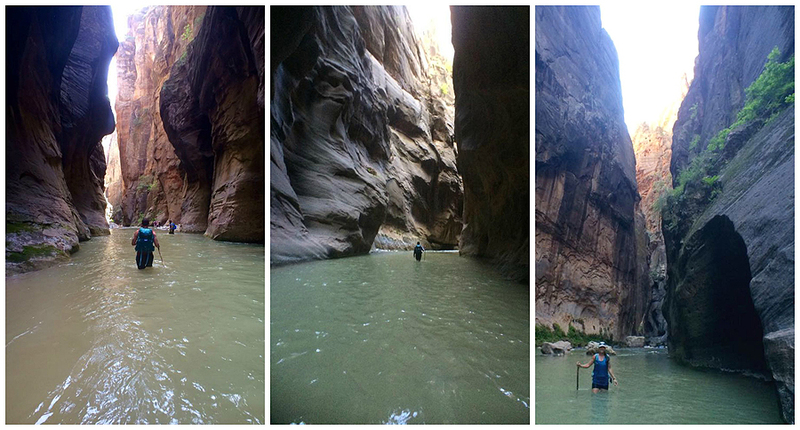 It was a joy to travel in and out of the narrows into these bigger view sections. The coolest part of the hike water wise. Past Big Springs the water levels increase two fold and it's constant wading from shins to waist. 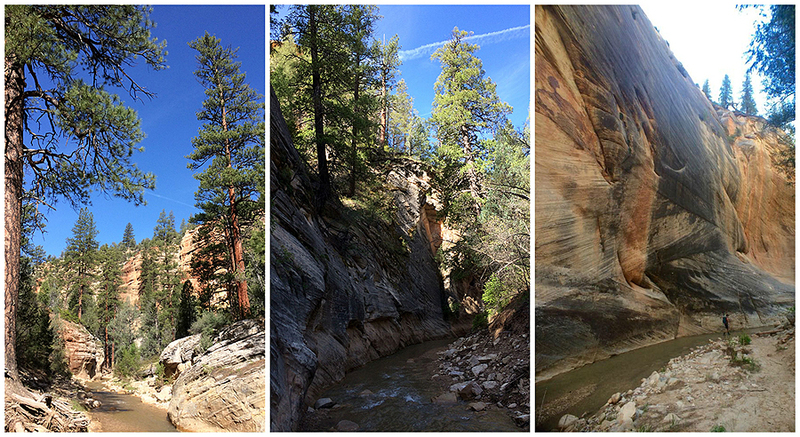 It's tiring and the high canyon walls block the sun so it does get a little chilly. 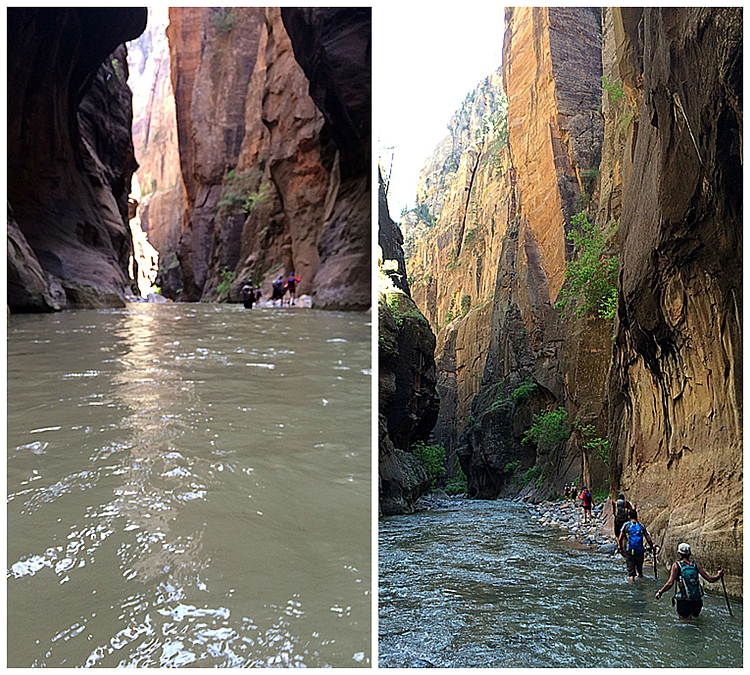 Making our way through the Virgin River. It was fascinating how around every corner the water levels would constantly change. Whitney snaps a great action shot as I head through Wall Street. Whitney makes her way to the end of Wall Street and gives the thumbs up! The last two miles was open with beaches then a paved trail to the Temple of Sinawava. There were people everywhere and we were hungry (like the deer below) so we motored our way through! Route for the day. We ended up hiking top to bottom in 8 hours 59 minutes. 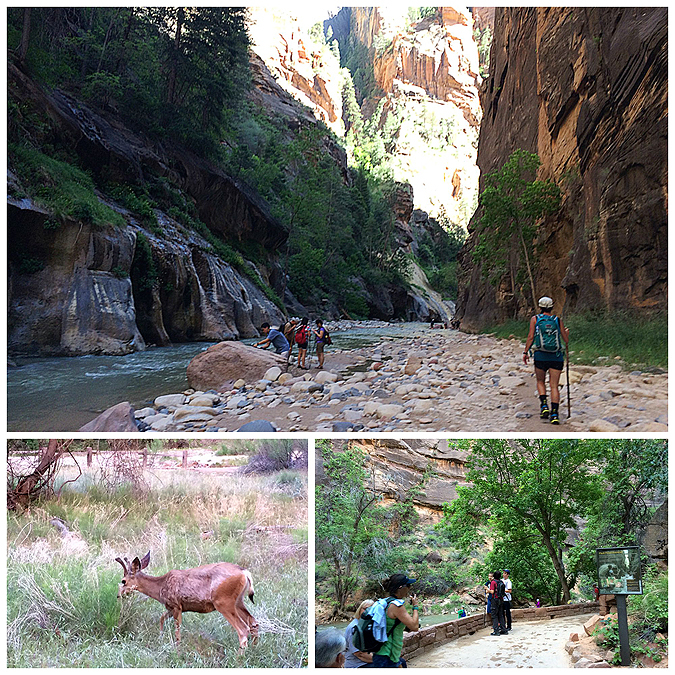 It was a really cool hike to experience and was challenging but not too strenuous. 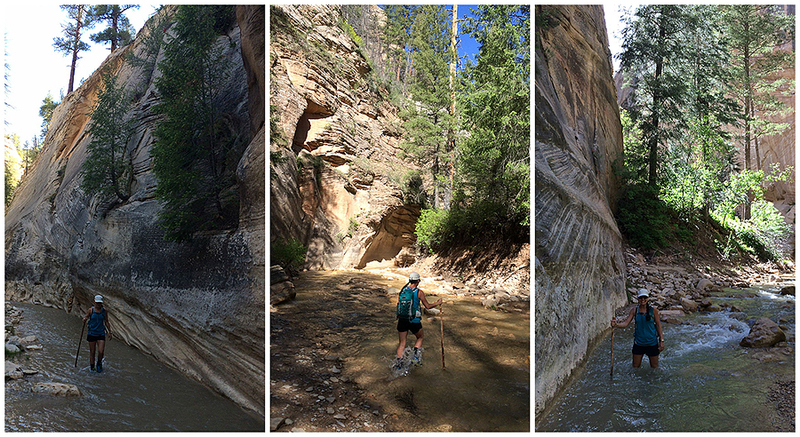 Our legs felt a little odd after from hiking through the water for several miles!